Being kind can be costly. Who foots the bill when farms want to make their operations better for animals? As consumer demand for meat, eggs, and dairy produced in humane ways continues to rise, a number of farmers are hoping to make changes to their operations. But doing the right thing for farm animals takes money—for spacious housing that allows animals to act naturally, for adequate feed that matches animals’ nutritional needs, and for more people or more training to oversee more complex care. Considering the fact that so many farmers can’t pay themselves a living wage, where can they get the cash to transition their operations, let alone launch a new humane farm? Farmers can certainly pay for more humane infrastructure the way they’d pay for any farm improvement: through U.S. Department of Agriculture (USDA) grants, bank loans, personal savings, crowdfunding, and even CSA-type investments from customers. But these options all have downsides. Very few farmers have savings, USDA paperwork can be laborious, banks don’t often want to take chances on small farms, crowdfunding can be fickle, and customers may not be able or willing to invest in their neighborhood farm. A number of foundations are focused on animal welfare. But most of these are putting their dollars toward fostering policy changes that could benefit the welfare of millions of animals at once, through the funding of advocacy campaigns that seek to end the use of severe confinement facilities. One option for farmers seeking to ease the financial burden of improving animal welfare is the “Fund-a-Farmer” program at Food Animal Concerns Trust (FACT). This Chicago nonprofit offers grants of up to $2,500 for such things as mobile chicken houses, portable electric livestock fencing, frost-free irrigation systems, and shade protection for pastured animals. Since its inception in 2012, the Fund-a-Farmer program—which itself is funded by individual donations and foundations—has awarded 67 grants totaling $138,000 to 63 farms in 26 states. “These grants aren’t a ton of money, but they make it possible for farmers to try something they weren’t comfortable trying on their own based on their year-to-year finances,” says Larissa McKenna, director of the Fund-a-Farmer project. One unusual grant allowed four small farms to obtain livestock guardian dogs, which keep predators away from pastured poultry and small ruminants. The grant was made to 1dr Acres Farm in Wisconsin, where Cherrie Nolden has worked with livestock guardian dogs for more than 15 years. The funding helped cover some of the basic costs of raising the guardian puppies and offering mentorship and training to the four FACT-approved farms where the puppies were ultimately placed. Last year, recognizing that healthy pasture is a humane issue, FACT focused its grants on helping farmers either improve existing pasture or transition to a pasture-based system. Without proper rotational grazing, pastures themselves don’t always remain healthy, and animals can suffer poor nutrition or illness—often to a point where confinement begins to seem like a less-cruel option. Brattset Family Farm in Wisconsin, for example, received a grant that will help the farm renovate a pasture that lacks fertility and productive forage. Black Mesa Ranch in Arizona, which has spent years eliminating most of the toxic plants on its range, was granted funds to purchase new grass seed and the equipment to plant it. 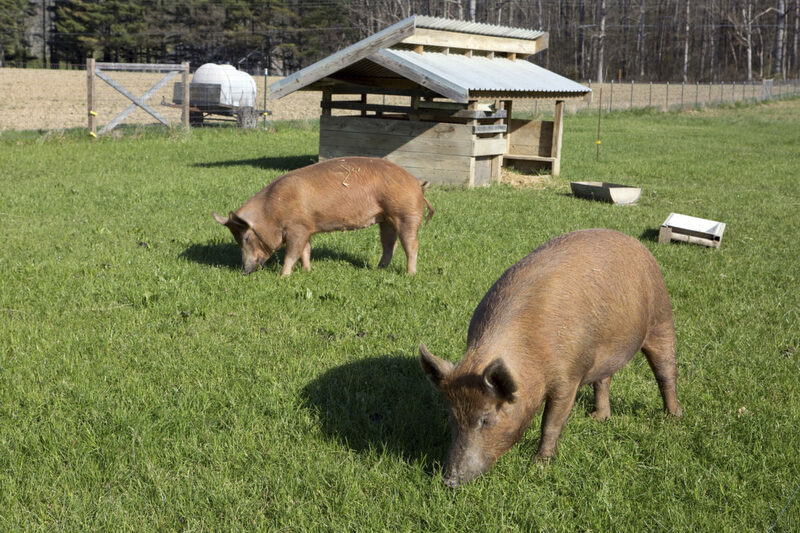 A grant to Wild Rose Farm in upstate New York will pay for fencing and feed equipment that will allow pigs to be transitioned from a feedlot system to a pasture-based one. Farms have received Good Husbandry Grants to pay for everything from egg incubators and poultry stunning knives to new breeding stock that introduces stronger genetics into herds. “In reality, you don’t need to spend a lot to get high welfare,” says Andrew Gunther, AWA’s program director. For farms that aren’t third-party certified, but adhere more closely to an industrial model, resources for making humane improvements appear to be more limited. Besides traditional funding routes, industrial farms can turn to companies they have contracts with, or to grocery stores they sell to, but there is no guarantee that the businesses will want to fund or invest in them. A spokesperson for Chipotle, a fast-food restaurant chain that makes it a point to source humanely raised meat whenever possible, wrote in an email that the company doesn’t offer humane-minded grants or loans to its farm suppliers, but it does run a Local Grower Support Initiative to help its small- and mid-sized farms meet food safety standards. Similarly, Bon Appétit Management Company (BAMCO), which operates 650 sustainable cafeterias at universities, corporations, and museums, ran a grant contest in 2014 which awarded money to some of its farm suppliers, but the company doesn’t assist farms with humane upgrades. Instead, said a BAMCO spokesperson, the company is putting its resources toward paying farmers a premium for meat and eggs raised according to its strong humane standards. This year, Perdue, the fourth largest chicken producer in the U.S., not only announced plans for significant animal welfare improvements, but also said it would pay for new windows in 200 existing chicken houses owned by its contract growers. However, this is only a fraction of the roughly 6,000 chicken houses Perdue does business with, and contract growers will still be responsible for paying for windows in any new houses. Josh Balk, senior director of food policy at the Humane Society of the United States, notes that when industrial livestock and poultry farms transition to more humane infrastructure—such as cage-free housing for laying hens or group housing for—they often choose to purchase the new equipment at a time when they have to renovate or replace existing equipment anyway, which can reduce costs. As for grocery stores, some food co-ops in the U.S. make grants or loans to local farms and food producers (for example, City Market in Burlington, Vermont has its Patronage Seedling Grant program, funded by co-op members who give back their annual dividend), but these programs might not be exclusively for animal welfare upgrades. In Germany, however, an animal welfare organization called “Initiative Tierwohl” announced in 2015 that a consortium of German grocery chains would pay conventional livestock farmers for voluntary improvements meant to improve the lives of pigs, chickens, and turkeys. The improvements are being funded through a small surcharge on retail meat sales that is either paid by the grocery chain or passed onto consumers. “It’s a groundbreaking initiative that encourages producers to improve farming conditions while giving them the money to cover related costs—something that is often missing when retailers request welfare improvements,” wrote Vicky Bond of Compassion in World Farming in a recent article. Some challenges to the program have surfaced, according to European media reports: The initiative does not have enough funds to support all the farms that qualify; some farms that were accepted already met the initiative’s criteria; and larger, new farms with more financial resources were over-represented among those accepted. Still, with many consumers reluctant to pay more for humanely raised meat, it will take more creative thinking such as that out of Germany to make humane farming more viable—and sustainable—for farmers who care deeply about the animals in their charge.